Well, here I was, sat at my computer and having an Englishman’s favorite brew, when I heard the familiar bling sound exit my speaker of the p.c. Obviously a message, and sure enough it was – and from my Girlfriend Jennifer. She had found an interesting link for me to view and kindly posted me the link, I clicked on it and almost spat my refreshing leafy beverage out all over the display case, she certainly knows how to get my attention and woke me up good and proper, Cheers Jenn!! Only a matter of time before these were going to be made again, only wish I could of done it,but these looks cool but not sure on Quality, loved to see one in the flesh. 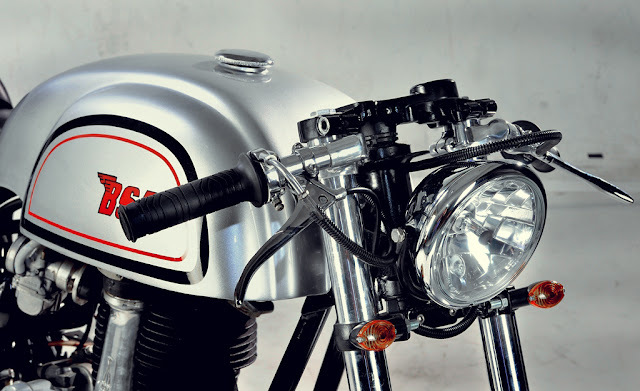 The Cafe Racer scene in Indonesia is alive and kicking. Despite the unavailability of large capacity motorcycles and the high expense involved with purchasing parts from other countries, skilled builders are fabricating their own parts to meet customer demands and the resulting build are nothing short of world class. This is the second Cafe Racer build to roll out of Studio Motor in Jakarta. 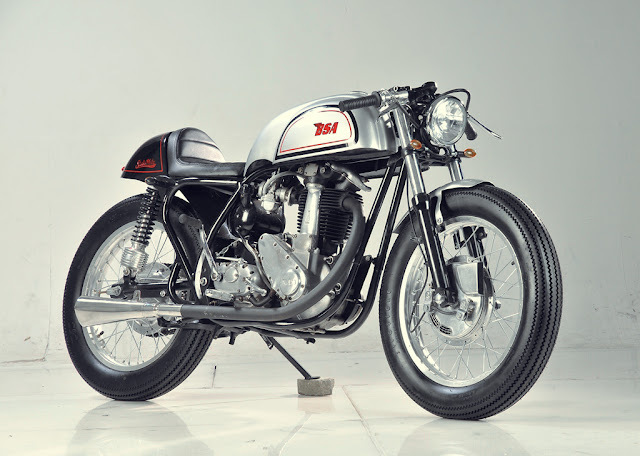 Back in June they released their 1954 Matchless Cafe Racer which had us eagerly waiting for more and they certainly haven’t disappointed. 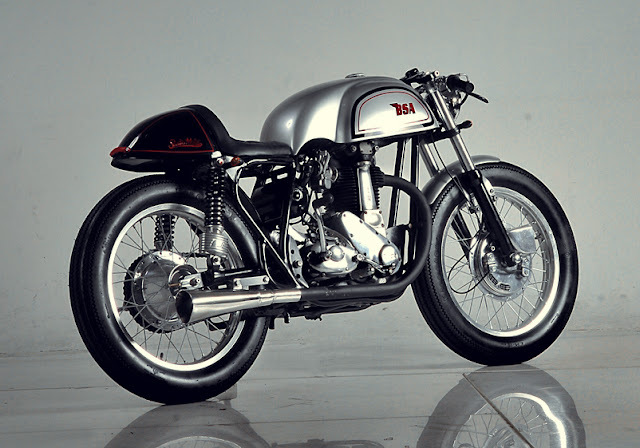 This is the Studio Motor M33 BSA based, Norton Manx inspired Cafe Racer. 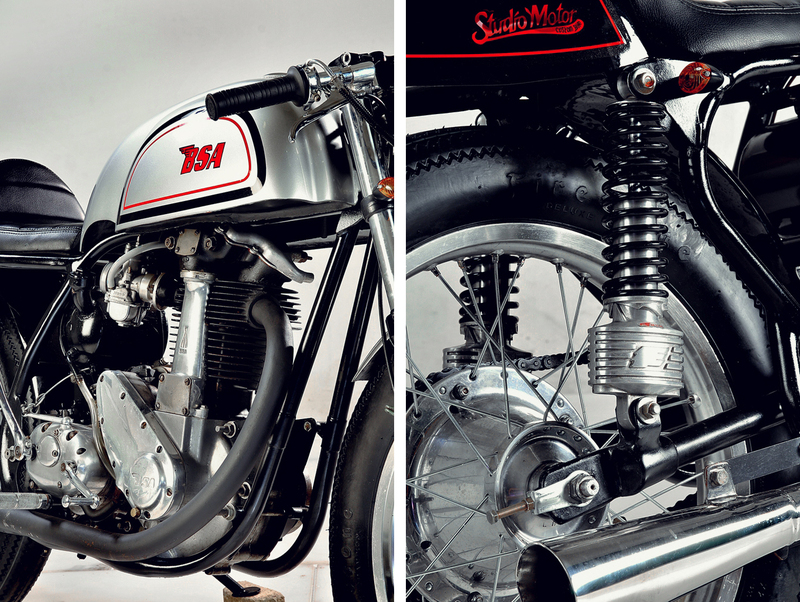 Using images sourced from the internet shop owner Donny Ariyanto set about building the bikes bodywork from scratch. The tank was hand fabricated in 1.2mm steel to match the Manx style as closely as possible with only photographs as a reference point. Dimensions were modified to suit the smaller BSA frame and a “wasps tail” cowl was fabricated to hug the shortened rear loop. The BSA’s original rims have been upgraded to TK wheels imported from Japan which are wrapped in classic Firestone Champion Deluxe rubber. Front and rear drum brakes provide plenty of stopping power for the 500cc single and go perfectly with the bikes classic look. The front suspension comes from a Yamaha Byson (Indonesian 153cc sports bike) while at the rear Donny has used the same retro styled Red Wing shocks we saw on his Matchless build. A set of clip on bars from a Honda CBR400 with only the bare essential controls cling to the top of each fork tube and a Bates style custom headlight sits between them, mounted on the lower triple tree. Upgrades to the M33’s performance come in the form of a KOSO carb jetted to suit the open stack and a Jet Hot stainless steel muffler free the exhaust gases. The tank has been finished in classic Norton Manx silver with black/red pins by local spray painters Comet Studio with the British Small Arms winged emblem emblazoned on it’s sides. Well done sir, my hat comes off to you. 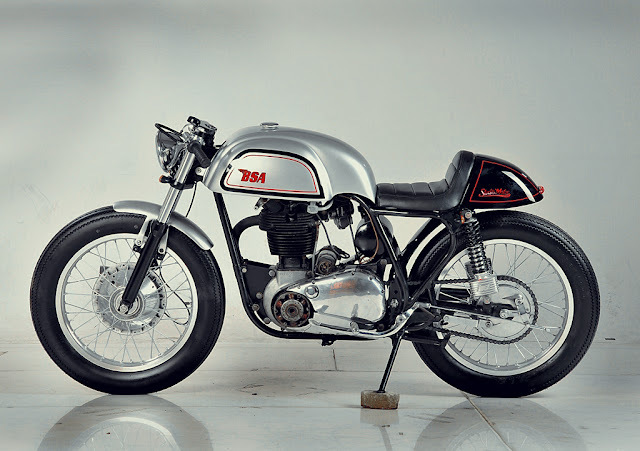 This entry was posted in Blog and tagged 59club, BSA, cafe racer, rocker, ton up.